The Pokémon Trading Card Game (ポケモンカードゲーム Pokemon Kādo Gēmu, "Pokémon Card Game"), abbreviated as PCG or Pokémon TCG is a collectible card game, based on the Pokémon video game series, first published in October 1996 by Media Factory in Japan. In the US, it was initially published by Wizards of the Coast; Nintendo eventually took over publishing the card game alongside the video games in June 2003. The game is somewhat similar to Magic: The Gathering, a trading card game also published by Wizards of the Coast. In this game, players assume the role of a Pokémon trainer and use their creatures, known as Pokémon, to battle. Players play Pokémon to the field and use their attacks to reduce the opponent's HP. When a Pokémon's HP is reduced to 0 it is knocked out and the player who knocked it out takes a Prize card into their hand. (Certain types of cards called Pokémon-EX cards are worth 2 prize cards if they are knocked out. However, they are significantly stronger than normal Pokémon.) A player may win the game in three ways: by collecting all of their prize cards (initially six, but some cards can increase this), if their opponent runs out of Pokémon on the field, or if at the beginning of their opponent's turn there are no cards left to draw in the opponent's deck. Players begin by shuffling their decks and drawing seven cards. Both players check to make sure they have at least one Basic Pokémon in their hand. If not, they must reshuffle and redraw and the opponent may draw one additional card. Once both players have at least one Basic, they both play one or more Basic Pokémon to their play field, one in the Active spot, and up to five on the "bench" (representing the six maximum carry limit from the video games). Players then take the top six cards of their remaining deck and place them to the side as their Prize Cards and flip a coin (or roll dice) to see who goes first. Play alternates between players who may take several actions during their turn, including playing new Basic Pokémon, evolving into higher level Pokémon, playing Trainer cards, playing energy (of which one is generally put down; further, it is needed to use most attacks), using non-attack Pokémon abilities, and retreating their active Pokémon. At the end of their turn, a player may use one of their Active Pokémon's attacks, provided the prerequisite amount and types of energy are attached to that Pokémon. Game effects from that attack are activated and damage is put on the defending Pokémon (some attacks simply have game effects but do not do damage). If the damage exceeds the defending Pokémon's HP, it is knocked out (i.e. discarded along with any attached cards) and the active player takes a prize card and ends their turn. As with almost any card game, the "Golden Rule of Card Games" applies, stating that "whenever a card's text overrides the game rules, the card takes precedence." For example, the game rules state a player may only play one energy card per turn, but several Pokémon abilities allow additional energy to be played if that card is in play. Basic Pokémon are the basis of all decks (which consist of 60 cards). Without them a player cannot play the game, since both players begin the game by placing a Basic Pokémon in the active position on the playing field. Each Pokémon card depicts a Pokémon from the video games. Each player may have up to six Pokémon on the playing field at a time: one "active" Pokémon and up to five on the bench (these are considered to be in reserve, but they can still affect gameplay). Each Pokémon card has a name, a type, and an amount of Health Points. All Pokémon feature attacks that deal damage to the opponent's active Pokémon, or occasionally, their benched Pokémon; still others perform different functions, such as manipulating players' possession of cards. The vast majority of these attacks require Energy, which comes in the form of Energy cards, though the occasional Pokémon may have an attack that requires no energy (these attacks typically are weak or perform a function other than damage). The two types of Pokémon cards are Basic Pokémon and Evolved Pokémon. Basic Pokémon are Pokémon that have not evolved, and can be played directly onto the bench. Each deck must have at least one Basic Pokémon to be considered legal. In contrast, an Evolved Pokémon cannot normally be placed directly onto the field; they must be played on the corresponding lower-stage Pokémon. Stage 1 Pokémon evolve from Basic Pokémon, and Stage 2 Pokémon evolve from Stage 1 Pokémon. As a Pokémon evolves, it gains HP and can use Energy more effectively. Baby Pokémon cards, introduced in Neo Genesis, are a special kind of Basic Pokémon, sometimes distinguished by a Poké-Power called "Baby Evolution". Baby Pokémon have low HP, but their attacks have strange and sometimes very powerful effects. Baby Pokémon with the Kick ability can evolve into another Basic Pokémon, specified on the card. When a Baby Pokémon evolves into what would normally be a Basic Pokémon, that Basic Pokémon counts as being an Evolved Pokémon for the purposes of cards that affect Basic Pokémon and Evolved cards differently. Introduced in XY, Mega Pokémon evolve from Pokémon EX, but are a special stage, and as such effects on Stage 1 Pokémon do not apply to Mega Pokémon and vice versa. Variations of Basic, Evolved, and Baby Pokémon cards have appeared in many sets, usually indicated with a word before or after the Pokémon's name. Secret Rare Pokémon cards are some of the rarest cards. These cards include Pokémon ex, EX, LV.X, Gold Star (cards with a gold star after the name) known better as Shiny Pokémon, Prime cards, Full art cards, Legend cards, and others. Energy cards are attached to a Pokémon to power attacks and retreats. There are two types of Energy cards: Basic Energy cards and Special Energy cards. There are ten different Basic Energy types: Grass, Fire, Water, Lightning, Psychic, Fighting, Darkness, Metal, Dragon, and Fairy. Darkness and Metal Energy could only be provided through Special Energy cards until the Diamond & Pearl expansion set, where they became Basic Energy types. Basic Energy cards only provide one Energy of the specified type, while Special Energy cards have additional benefits and varying Energy provisions. Additionally, the amount of Basic Energy cards allowed in a deck is unrestricted, while Special Energy cards follow the standard rule restricting the number of cards with the same name in a deck to four. Some attacks require a certain type and amount of Energy, usually depending on the type of attack and the Pokémon using it. If an attack requires a certain type of Energy, then that type and amount of Energy must be attached to the Pokémon, whereas if the attack has a Colorless Energy requirement, that requirement can be met by any Energy card. Trainer cards perform various functions to affect the game. Some can remove damage counters (which you tell how much damage a card has) from Pokémon, remove energy from the opposing Pokémon, or revive Pokémon that have been knocked out. Before the Diamond & Pearl expansion, all cards that were not Pokémon or Energy were considered Trainer cards, though they have since been subdivided into categories: Item cards directly affect the battling Pokémon, Stadium cards represent custom arenas that add a special mechanic to gameplay, and Supporters represent other characters in the Pokémon world. There are also some cards that are two card types in one card. Examples include the "Clefairy Doll" Trainer card in the Base Set, which can be played as a Pokémon card, or special Pokémon that can, rather than battle, be attached to other Pokémon as Energy cards (Such as Holon cards). Pokémon ex cards were first introduced in the TCG set: EX Ruby and Sapphire, and typically had higher Hit Points than other Pokémon, yet gave an extra prize card to the opponent upon their being defeated. 1 Starting with the Diamond & Pearl expansion, Poison-type Pokémon in-game are now Psychic; they were previously Grass. 2 Starting with the Black & White expansion set Dragon Selection, Dragon-type Pokémon in-game are now Dragon; they were previously part of Colorless. Most Pokémon have only one type. However, EX Team Magma vs Team Aqua introduced Dual-type Pokémon, which have two different types. All existing Dual-type cards have either Darkness or Metal as their secondary type, with the exception of certain Pokémon cards with the Dual Armor Poké-Body, such as Medicham from the EX Crystal Guardians expansion, which can have multiple types when certain energy are attached. Weakness and resistance are determined by the type of the attacking Pokémon (unlike the video game series, where they are determined by the type of the attack used). In older sets, Pokémon that are weak to another type take twice the base damage in an attack, while resistance decreases attack damage by 30 points. With the release of XY8: BREAKthrough in Japan on September 15, 2015, there are currently 64 different Pokémon TCG sets released in English and 61 released in Japanese. A rarely played format is Unlimited, in which all cards released in English are legal (except oversized cards, such as large box topper cards, and banned cards). Every few sets, new types of cards are introduced to the Pokémon Trading Card Game. Several of these include: Dark Pokémon (Team Rocket); Owners' Pokémon and Stadium cards (Gym Heroes); Darkness-type and Metal-type Pokémon, the second generation, and Pokémon Tools (Neo Genesis); Shining Pokémon (Neo Revelation); Light Pokémon (Neo Destiny); Supporter cards and Technical Machines (Expedition); Crystal-type Pokémon (Aquapolis); Pokémon-ex (EX Ruby & Sapphire); Dual-type Pokémon (EX Team Magma vs Team Aqua); Pokémon Star (EX Team Rocket Returns); Delta Species Pokémon and Holon's Pokémon (EX Delta Species); Pokémon LV.X, the separation of Trainer, Supporter and Stadium cards, and the addition of Metal and Darkness as Basic Energy types (Diamond and Pearl); Pokémon With Items (Mysterious Treasures); Trainer cards of which two can be played at once (Stormfront); owner-specific Pokémon SP (Platinum), Pokémon LEGEND (HeartGold and SoulSilver Collection), Pokémon PRIME which replace Pokémon Lv. X ("HeartGold and SoulSilver Collection"), Full Art cards (Black and White), and Dragon-type Pokémon. These changes, along with yearly format rotations, make for a constantly evolving game. In addition to the collectible aspect of the card game, The Pokémon Company International (formerly known as Pokémon USA) has also created Play! Pokémon, formerly known as Pokémon Organized Play (POP), which is in charge of the organization of an official League program, where players can battle others in local environments and earn player points, two-card booster packets from a promotional set, badges, stickers and other materials. These are run by League leaders and owners. POP also runs a professor program, in which individuals age 18 or over may become a professor, who can sanction and run tournaments and leagues. A League Leader may assist in organizing the league, while a League Owner is the one officially in charge of the league, reporting to the Organized Play program any results and/or problems every seven weeks. The leagues run in yearly cycles, based on a certain aspect of one of the Pokémon Game Boy or DS games: the current cycle is based upon the Energy types. Prerelease tournaments are organized just before each set is released. Usually, they are run on the two weekends before a set is released in stores to the public. At prereleases players are given booster packs from the judge and must construct a 40 card deck, with only 4 prize cards, using only the cards pulled from the packs and the judges provide the energy, but not special energy cards. Many fans have come up with alternative methods of playing the Trading Card Game. Certain websites such as PokéCap are dedicated to providing players with a new twist to their card game with new game rules they can follow. New methods may be based more on the video game adaptations of Pokémon or the Pokémon television show. Players in a tournament are split into three age categories: Junior (born in 2003 or later), Senior (born in 2000-2002), and Master (born in 1999 or earlier). Notable references include: Austin Brewen who won the first junior tournament, Brenden Zhang who won the first Senior Tournament, and Arturo Heras who won the first Master Tournament. These tournaments play a number of rounds, where players will play a standard game against each other and wins and losses will be recorded. In most tournaments, there are a number of Swiss-style rounds where players are paired up against others of similar win/loss ratios, usually from their own age group (this does not always occur in smaller events, though). Afterwards, there will either be a cut of the top record-holders (approximately the top 1/8 of participants) where players will play best two out of three matches, and the loser gets eliminated (standard tournament bracket style), with an eventual winner. POP runs a season for these tournaments, which allows players to earn larger prizes and play in a more competitive environment in comparison to League. These range from City and State Championships, all the way up to the Pokémon World Championships, the single invite-only event of the year. Players can earn invites to the World Championships by winning or ranking high at National Championships, doing well at tournaments to get Championship Points, or by qualifying in the Last Chance Qualifier. The World Championships is a three-day tournament, with one eventual winner in each age group; the winner of the Masters Division age group is generally noticed as the best player in the world for that season. Some of these methods are only used in the USA, as PUI and POP are based in the USA, but they are represented by local distributors who provide the Organized Play program to their own country. On August 26-27, 2000, forty-two Pokémon trainers from around the world met at the Hilton Hawaiian Village in Honolulu for the Tropical Mega Battle, an international communication event for the Pokémon Trading Card Game. The Tropical Mega Battle brought together children aged 14 and under from the United States, Japan, France, Italy, Canada, Spain, Germany, the Netherlands and the United Kingdom, for two days in Honolulu, Hawaii. Children participating in the Tropical Mega Battle received invitations through Qualifier tournaments, DCI rankings, and other events in their respective countries. The Super Trainer Showdowns were large Pokémon TCG tournaments held in the United States by Wizards of the Coast between 2000 and 2001. The tournaments were open to the public. Each tournament consisted of three age groups; 10 and under, 11 to 14 years old, and 15 years old and over. Each Super Trainer Showdown was preceded by a series of Qualifier Tournaments held in cities around the United States and abroad in which players in the 11-to-14 and 10-and-under age groups could win trips for themselves and a parent or guardian to the Super Trainer Showdown event. To date, there have been four Super Trainer Showdowns. The first Super Trainer Showdown was held in Long Beach, California inside of the cruise liner, the Queen Mary on July 22, 2000. 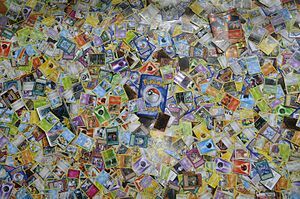 The format was unlimited, meaning that all Pokémon cards released in the United States were legal for deck construction. The second Super Trainer Showdown was held at the Meadowlands Exposition Center in Secaucus, NJ on November 18, 2000. There were over 700 players in all three age divisions competing for the title. The tournament was eight rounds of Swiss style pairings followed by a cut to a top-eight single-elimination playoff. All games were best-of-one. The third Super Trainer Showdown was held again in the Meadowlands Exposition Center in Secaucus, New Jersey. It was held on June 23-24, 2001 and more than 1,600 players attended the event. The format for this event was titled “Modified” and allowed players to construct 60-card decks using a maximum of four of any card other than basic energy from specific sets. The fourth and final Super Trainer Showdown was held at the San Antonio Convention Center in San Antonio, Texas on December 1-2, 2004. The format was again "Modified", however the newest set Neo Discovery was also legal for the tournament. Although TPCI tries to keep Organized Play as equal as possible all over the Earth, there are some notable differences in how POP is run outside of the USA. The Pokémon Card Laboratory (PCL), located in Japan, is the designer of new cards and the ultimate authority on any matter relating to the Pokémon Trading Card Game. It can declare rulings on any in-game circumstance, issue errata, change card text after publishing, and change the basic game rules, although the latter three rarely occur. PCL runs Organized Play in Japan. The Pokémon Trading Card Game in most European countries is currently handled by The Pokémon Company International. Certain countries have no direct official presence; in these regions, distributors of the game run tournaments. European countries are able to qualify for positions at the Pokémon Trading Card Game World Championships each year, through National Championships and European Rankings. There are a few video games based on the card game. Pokémon TCG Online is the official digital version of the card game available for Microsoft Windows, OS X and iPad. It was originally released in April 2011 as Pokémon Trainer Challenge. The game initially offered three starting decks, and featured more content after release. After April 6, 2011, players could buy cards from the Black and White series, which have a code to be digitally represented. Players can also create a custom avatar. There were booster pack codes which allow booster packs up to Black and White-Boundaries Crossed, to be purchased from the online shop. However, as of Black and White- Plasma Storm, the code card within booster packs directly redeem as online booster packs of their respective set. GamesRadar praised the game, stating "Everything looks to be faithfully recreated, including the card mat, prize card layout, and even coins." The eponymously titled Pokémon Trading Card Game, known as Pokémon Card GB in Japan, was developed for the Game Boy Color, releasing in Japan in December 1998 and later in North America and Europe in 2000. The game is based on the rules of the card game and features 226 cards from the game, as well as infrared linking for multiplayer and trading. The game was rereleased for the Nintendo 3DS Virtual Console in 2014. A sequel, Pokémon Card GB2: Great Rocket-Dan Sanjō! was released exclusively in Japan in March 2001.